No wonder then, that in this month the hearts of the believers turns to their Most Merciful Lord, fearing their Lord above them, and hoping to attain His reward and the great victory (Paradise). As the status of this act of worship is so high, it is essential to learn the ahkaam (rulings) that have to do with the month of fasting so that the Muslim will know what is obligatory, in order to do it, what is haraam, in order to avoid it, and what is permissible, so that he need not subject himself to hardship by depriving himself of it. 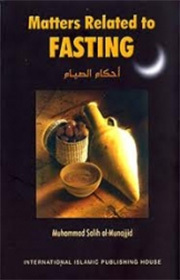 This book is a summary of the rulings, etiquette and Sunnah of fasting. May Allaah make it of benefit to myself and my Muslim brothers. Praise be to Allaah, Lord of the Worlds.